Sorry that it has been such a long time since I last posted. Well let me catch you up on what ha been happening. I have started my HND year at Dundee college and I have to say that i am loving it! I have quite a few projects and I am going to share some of them with you. Going from my research through to the final design. This first project is called Textile Accessories Advanced. 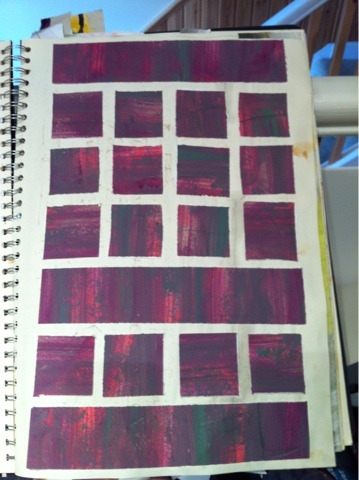 The theme that I have chosen is grids and lines. By then end of this project I have to produce a collection of 3 accessories. 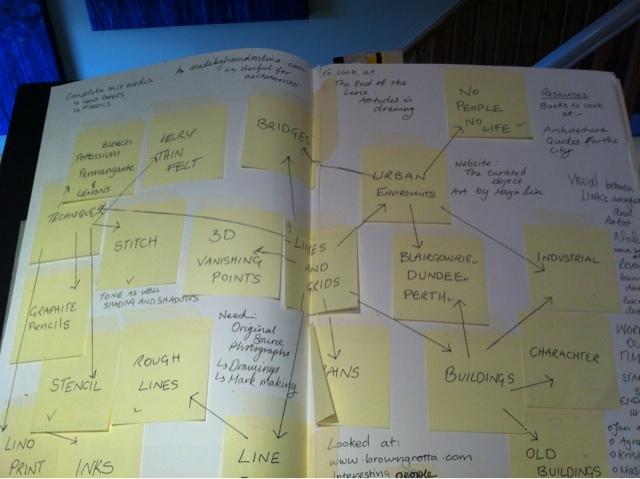 For me a project nearly always starts with me making a mind map. Yeah I know right this minuet you are almost certainly thinking; wow, that is a little crazy! well at the beginning of any project you are right, crazy kind of covers it due to the overwhelming ideas that you get. But from this beautiful mess I decided to go with buildings. 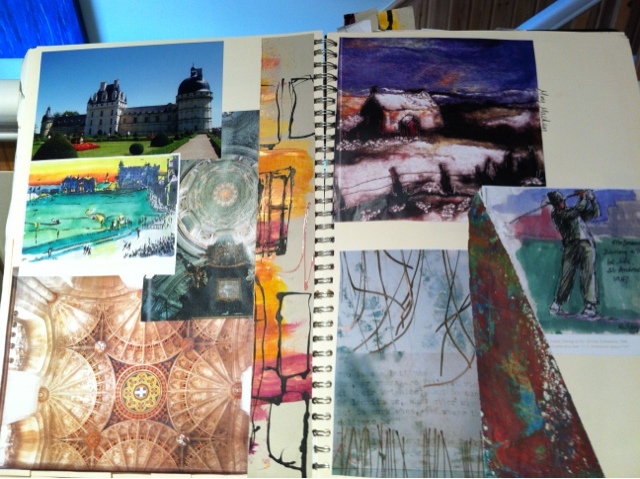 These pages of my sketchbook are a mixture of original source photographs and secondary sources. 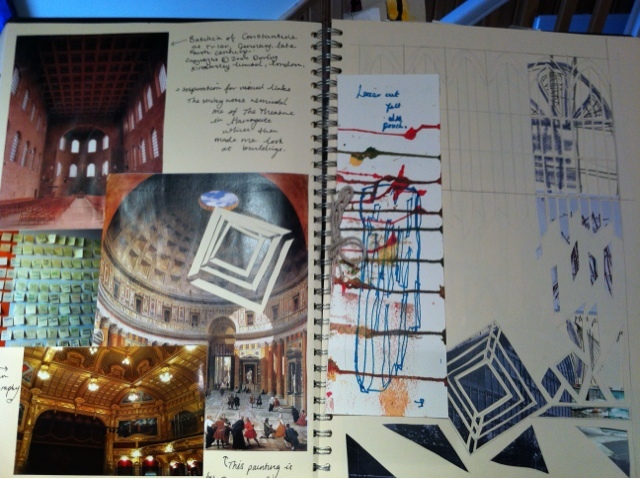 the other page is a stencil inspire by these photos and the middle piece is an ideas card. On the left hand of this page is a photo of parts of New York being built, in the centre is a piece by Stephan Annened, and below it there is a picture of Dundee's high rise flats. finally to the right of the page there is some of my own mark making. As I continued to look at buildings and the type of lines that they have and that I like to make I found a plethora of other artists that are inspiring to me. The left page consists of my own photo of a most wonderful Chateaux in France in the Loire Valley, Where many a happy memory has been formed. Also on this page there are two pictures of stunning architecture. My inspirational designer on this page is called Harold Riley, and his use of wonderful colours and lines are the reason why he is on this page. The right hand page see inspiration from Harold Riley, Bridget Collins and Moy Mackay, with a small triangle of my own playing. After I completed my research on lines and grids. 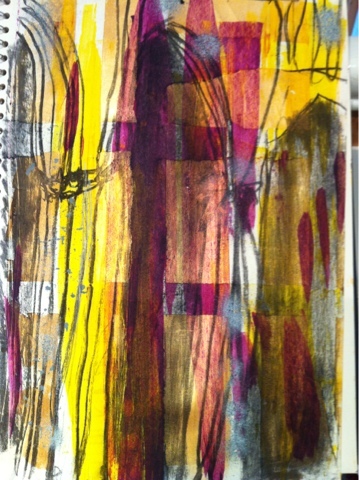 we had a workshop with our lecturer, on mark making. I created this page by using an A3 piece of watercolour paper used three different colour of paints some textured and I scraped it across the page. 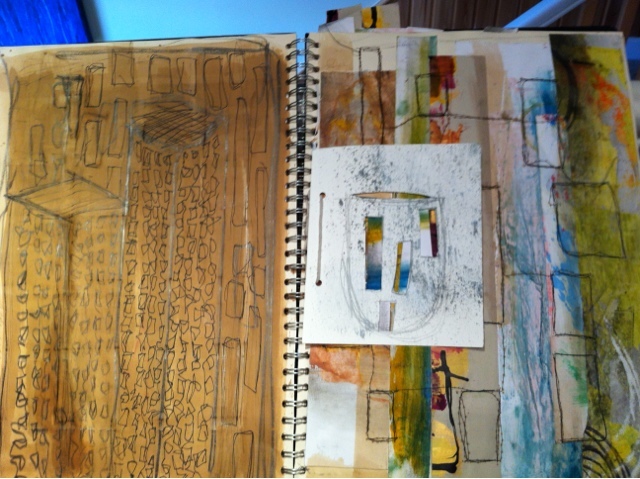 let it dry then cut it up and places it into my sketchbook. After the work shop I finally got down to making some marks of my own. 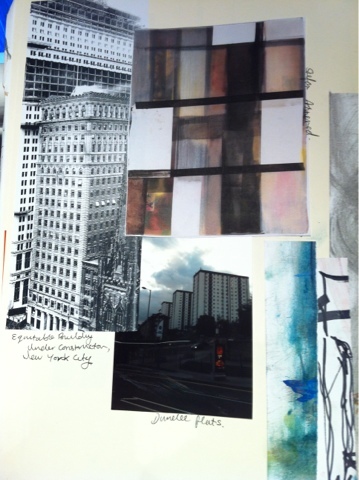 these are a mixture of media including stitch and graphite. This page is made with acrylic paints and charcoal. 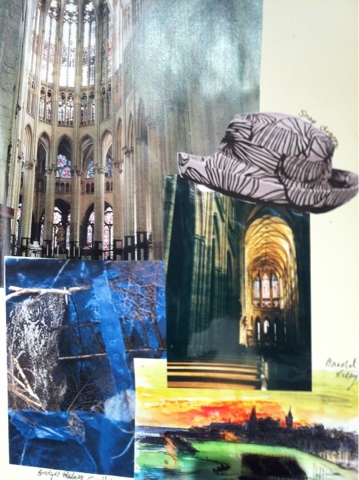 It represent the cathedral arches in my research. Well that is all for now, I will keep you updated every week on the progress of this subject. If you have ay questions please feel free to contact me. Labels: Dundee, Dundee college, personal work, Scotland, sketchbooks work.